: All-electric automated shuttle manufactured by French firm NAVYA. Feedback survey to gauge passenger reactions. David Fair (DF): This is 89-1 WEMU and I’m David Fair. It was about three years ago we devoted an episode of our monthly environmental feature, “The Green Room,” to the eco-considerations of driverless cars. Back then, the concept was mostly theoretical. That is no longer the case. Automated vehicles are not only being tested, but put to practical use on roads all over the world. And, sadly, the first non-motorist fatality has happened, as well; in March a bicyclist crossing the street, mid-block, was hit by a self-driving Uber in Arizona. Experts still seem confident that overall this new technology will be vastly safer for everyone. But what about its carbon footprint? In this new installment of “The Green Room,” Barbara Lucas explores what this monumental change in our transportation system could mean for carbon emissions. Greg McGuire, MCity Lab Director with their self-driving shuttle. 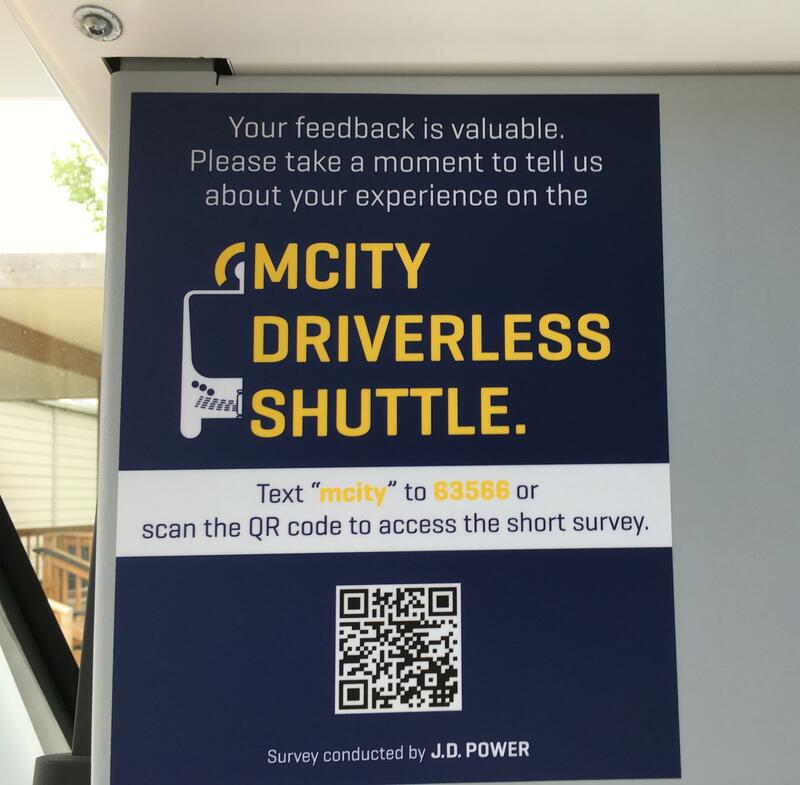 Greg McGuire: …the Mcity test facility, which is the University of Michigan’s purpose-built proving ground for Automated and Connected Vehicles. Barbara Lucas (BL): That’s Greg McGuire, the lab director of MCity. 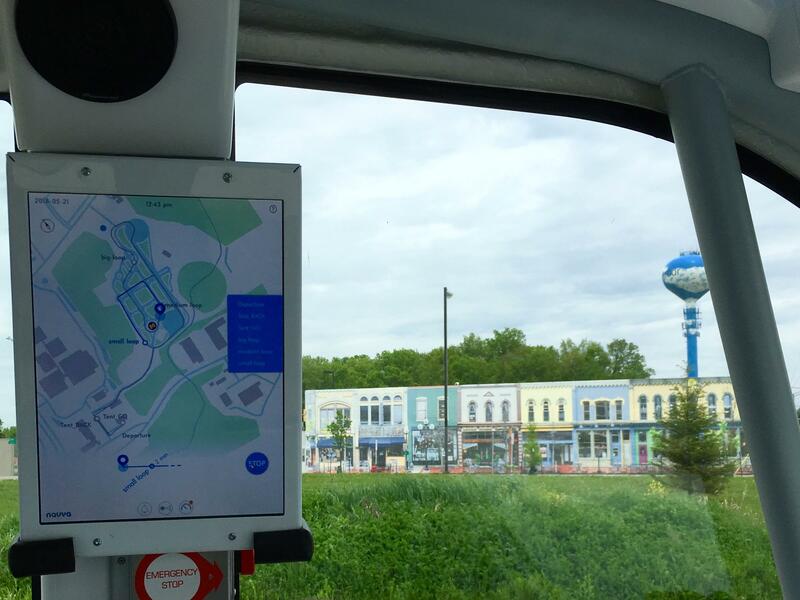 BL: We’re riding an electric self-driving shuttle, like the one that will soon start running a two-mile route on U of M’s North Campus. It’ll be the first college campus to have such a service. Its purpose is to assess reactions of passengers, and interactions with non-motorists. He says they’re also working with the Department of Energy, to analyze energy consumption. McGuire: Things like air-conditioning and heating and passenger comfort—but also distance and acceleration and those sorts of things. BL: We’re at the entrance gate to MCity. More honking. McGuire: So it wants that obstacle to clear out of the way. It doesn’t know the difference between a fence and a vehicle. It just knows there’s an obstacle. 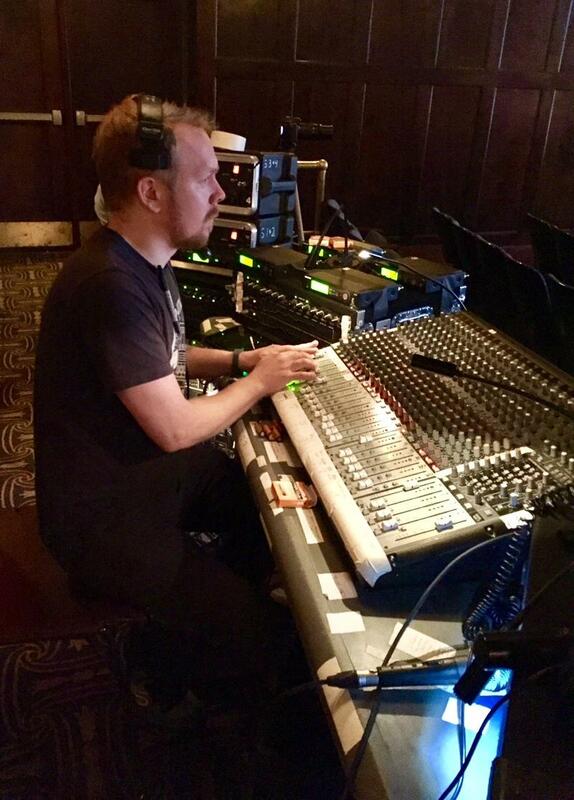 So it’s set up to honk. BL: The last time I was at MCity, it was July 2015, at its grand opening. While the speeches there focused on the potential safety impacts, I interviewed people about the potential environmental impacts. I wasn’t the only one wondering about this angle. I’m walking around U of M’s campus with former aerospace engineer Jim Gawron. Jim Gawron: I was working on satellite technology for NASA and we were actually designing a mission to observe climate change. It motivated me to not want to just observe the effects of climate change anymore but I wanted to do something more about them. BL: So, Gawron enrolled at the University of Michigan Erb Institute’s graduate program in business sustainability. 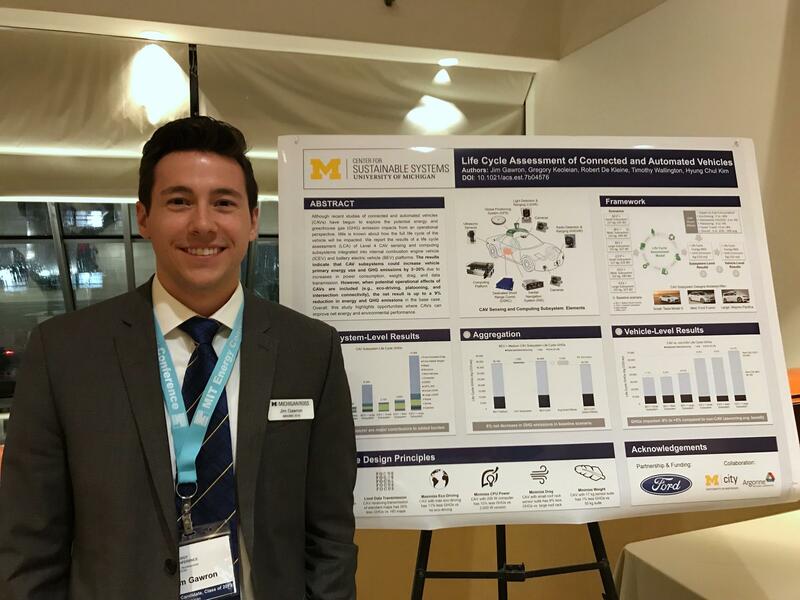 He began working with Dr. Greg Keoleian to study driverless cars—to analyze their carbon footprint and develop guidelines to reduce that footprint. He calls them CAVs: Connected and Automated Vehicles. Gawron: So all CAVs are able to talk to each other. So that's the connected part and then the automated part is that it has sensors and a control system that actually drive the vehicle. BL: Their research shows a CAV transportation system has great potential to either save energy, or squander it. For instance, they found that how much data a CAV’s sensors use makes a surprising difference. Graph: Changes in energy consumption due to various mechanisms facilitated by automation. Credit Wadud Z, MacKenzie D and Leiby P.
Gawron: That can increase your total energy and emissions use by 35 percent compared to conventionally driven vehicle. BL: From my phone plan, I know using data takes money. I didn’t realize it takes energy too! But their research also analyzed the multiple ways CAVs can save energy: They can communicate with stoplights and other vehicles. Take routes with less congestion. Travel smoothly. Avoid braking and accelerating. Make parking hunts a thing of the past, by either self-parking or going off for other passengers. Gawron: There have been some studies have shown that in high density urban environments up to 25 percent of the vehicle miles traveled in that area is people just circling around looking for parking. BL: But what if we send the car to roam aimlessly to avoid paying for parking? Or, what if we choose to live farther away because it’s now convenient and cheap to travel? Gawron says predictions are CAV travel could be less than a third the cost we pay today. Gawron: If the economics are there, the only way to avoid some of these unintended costs would then be good policy and regulation. BL: He says there could be a price put on vehicle miles traveled, especially on “empty” miles: CAVs without a passenger in them. But what if the energy to run them is renewable? Gawron says no form of energy is completely benign or free. And neither is our roadway infrastructure. Gawron: So when you take a green landscape and replace it by the grey infrastructure—by concrete, by buildings—there's definitely an impact on emissions that you have. Because now instead of having the plants that take up carbon you have potential infrastructure that has emitted carbon in its construction and now is not a net sink of carbon. Gawron: I think this provides the incentive for people to take mass transit now because it is now more convenient, lower cost. You don't have to deal with parking when you get to your destination. It provides more of a door-to-door type of service. BL: What about the gains made in bicycling, a nearly carbon-free mode of travel, which according to the League of American Bicyclists, is up 51% since 2000? Especially now that we’ve had our first cyclist fatality by a CAV—that test vehicle in Arizona in March—will cyclists really feel comfortable sharing the road with them? I check in with Michigan Department of Transportation Director Kirk Steudle. A cyclist himself, he’s not worried. Kirk Steudle: It knows you're there. And I'm very comfortable and confident that that's what… you know, when you're in the roadway, you're in their field of vision. They're going to see you. When you're in the crosswalk, they're going to see you. BL: On June 1st Steudle will address “Autonomous Vehicle Technology and Bikes,” at the Michigan Bicycle Conference in Grand Rapids. He tells me he’s had human-driven trucks come dangerously close to him while cycling. In contrast, he says automated vehicles will give wide berth. But still, he says non-motorists will always need to be on the defensive and make sure cars see them, whether they’re CAV or not. Steudle: When you dart out spots where you are not supposed to be and the cars not expecting—just like a driver doesn't expect you to come running out, you know, behind a tree—that's when you're going to put yourself in more danger. I think, that in the end, all safety will be improved with automated vehicles. But we've got a messy transition period between now and 25 or 30 years from now. BL: Currently, almost a third of U.S. carbon emissions come from transportation. And while more walking and biking would reduce that, Gawron says designing our cities to be higher density and more walkable is not going to happen overnight. So in the meantime, he’s hoping we at least go electric. That can reduce energy and emissions up to 60 percent. Gawron: The effect of increasing electric vehicle adoption, to me is one of the biggest opportunities. BL: How soon might we start saving energy through the widespread adoption of CAVs? Gawron: Well, I think as long as people have good experiences with the technology it can happen pretty quickly. 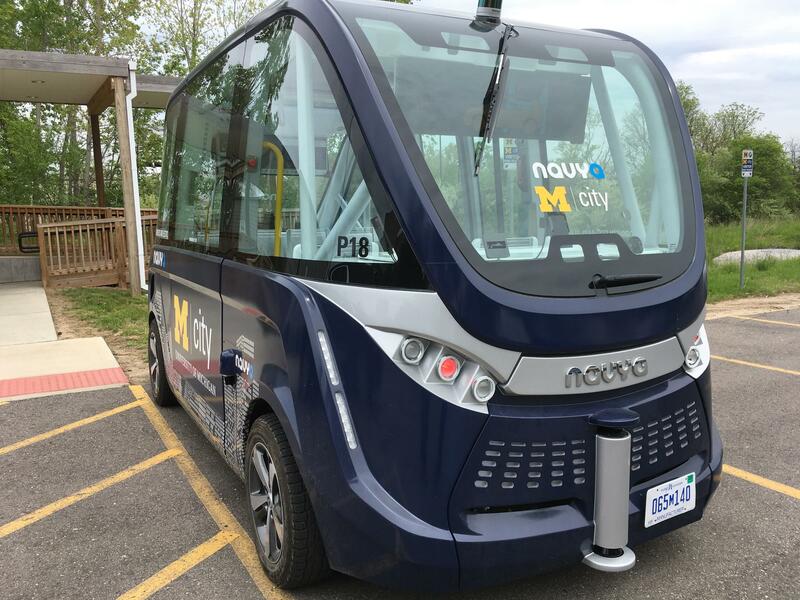 And so that's why I'm very excited about the driverless shuttle that is going to be operating on the University of Michigan North Campus because it will give people the opportunity to experience it for the first time. I think a few safe experiences will make people welcome it with open arms. Fade in sound of shuttle. BL: When I rode the test shuttle with Greg McGuire, he clearly had complete confidence in it. He wasn’t manning any back-up controls. He seemed totally unconcerned as it went by a moving car in the parking lot, and pulled itself—with one impressively smooth move—into a tight spot. McGuire: We just pulled into a parking space right next to your car—right? And we didn’t hit it! BL: In the Green Room, I’m Barbara Lucas, 89.1, WEMU News. 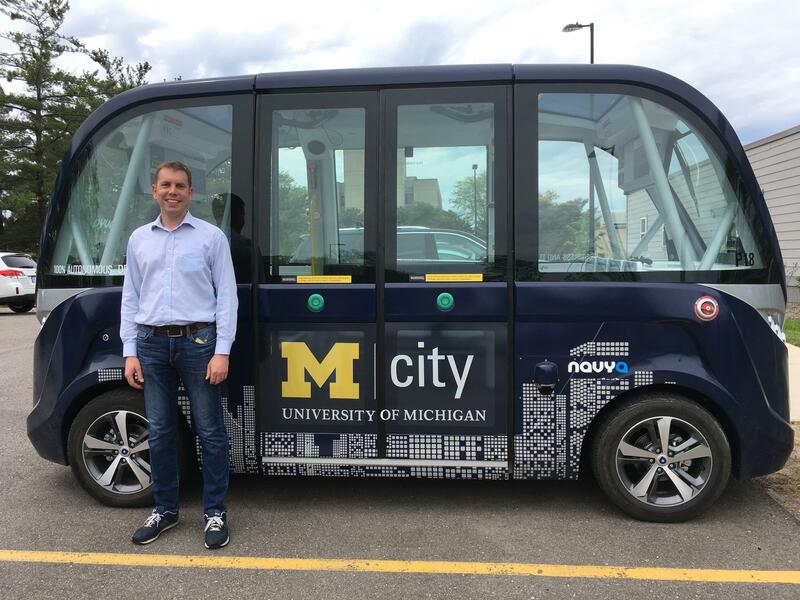 DF: WEMU will continue to provide updates on the start of the University of Michigan’s driverless shuttle service. “The Green Room” is a monthly environmental feature heard on the last Friday of each month. To access previous installments of “The Green Room” visit our archive at wemu.org. I’m David Fair and this is 89-1 WEMU FM and WEMU H-D One, Ypsilanti. “The Green Room: Eco-Considerations Of Driverless Cars” by Barbara Lucas, July 31, 2015, WEMU News 89 One FM. “Life Cycle Assessment of Connected and Automated Vehicles: Sensing and Computing Subsystem and Vehicle Level Effects” by James Gawron, Gregory Keoleian, et. al, Environmental Science and Technology, February 15, 2018. “Self-driving Uber kills Arizona woman in first fatal crash involving pedestrian” by Sam Levin and Julia Carrie Wong, March 19, 2018, The Guardian. “Automated Vehicles are Coming!” by Ken McLeod, March 13, 2018, League of American Bicyclists. "Help or hindrance? 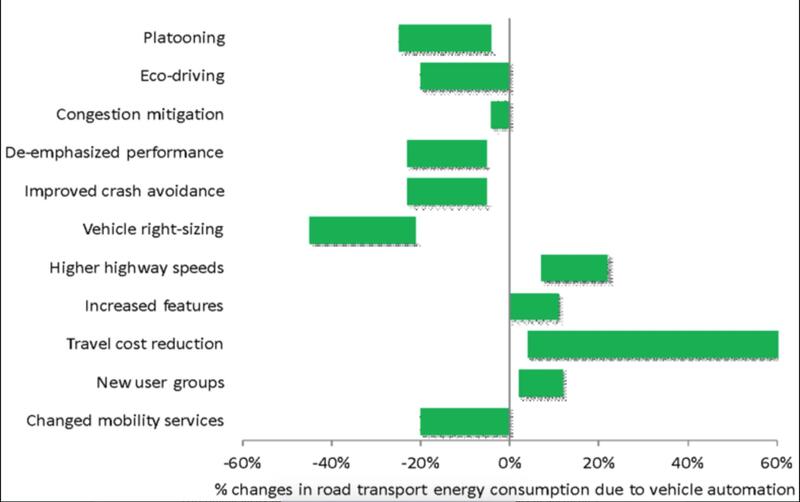 The travel, energy and carbon impacts of highly automated vehicles" by Zia Wadud, Don MacKenzie, and Paul Leiby, April 2016, Transportation Research Part A: Policy and Practice. 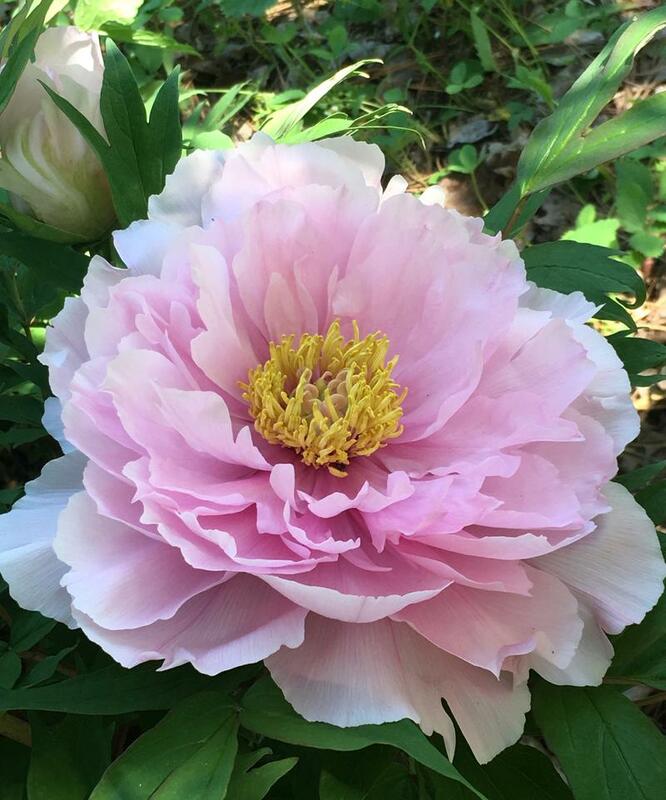 The bloom season is just beginning at Ann Arbor’s historic peony garden in the Nichols Arboretum. Ann Arbor City Council could pass its 2018-2019 Budget tonight. 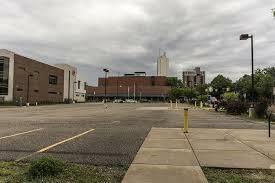 It may also vote on a settlement with the current owner of the "Y" lot. Those are just a few of the civic engagement opportunities in Ann Arbor and Washtenaw County this week. WEMU's David Fair and Mary Morgan of the CivCity Initiative cover you options in this week's edition of "Civic Matters."